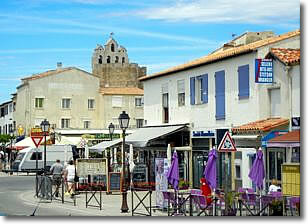 The Capital of the Camargue is a center of tradition and of festivity. 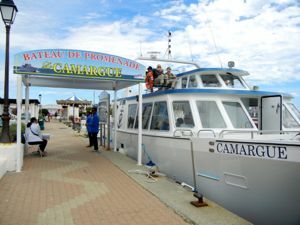 There are not a lot of towns in the Camargue, since much of it is protected as the Parc Naturel Régional de Camargue. Les Saintes-Maries-de-la-Mer has thus earned the name, Capitale de la Camargue. The church of Les Saintes-Maries-de-la-Mer has a long history. The site is said to have been where Mary, the mother of James (St Mary Jacobé), Mary Salomé, Mary Magdalene and other refugees from Jerusalem landed in the first decades of Christianity, after they escaped from Palestine on a boat without a rudder. Today the Romanesque steeple stands above the narrow streets, with their many shops and restaurants. Visitors can ascend the steeple and enjoy the views of the beautiful Camargue. The church has been a pilgrimage site since the 12th century, honoring St Mary Jacobé and St Mary Salomé, the saints of the village. In addition, the church is also home to an annual gypsy pilgrimage honoring St Sara the Black. From Les Saintes-Maries-de-la-Mer, you can take excursions to see the wildlife in the park—by car, on foot, by bicycle, or on horseback. There are many riding schools and stables that offer horse-riding trips for people of varying levels of experience. You can also visit a manade, where the horses and bulls are bred and live. Les Saintes-Maries-de-la-Mer is also home to a number of Camargue traditional festivals throughout the year, most focusing on the famous horses and bulls. Here's a story of a visit during the town's biggest celebration. The Tourist Information Office can provide information about festivals, and about excursions on land or sea. Street scene in Les Saintes-Maries-de-la-Mer, Camargue.